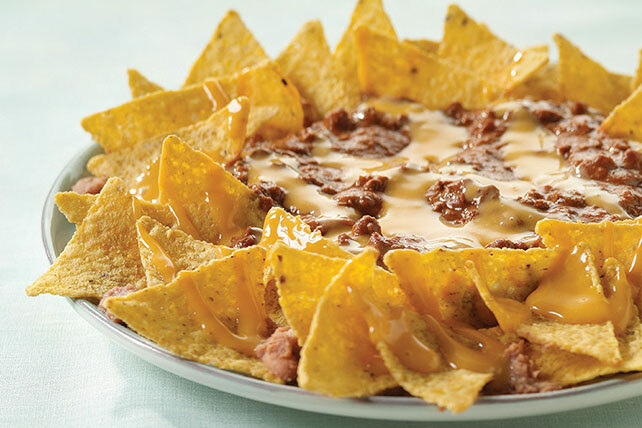 Canned chili and cheese sauce are heated and poured over refried beans and tortilla chips in this hearty snack. Spread beans onto center of large serving platter. Arrange chips around beans. Heat chili as directed on label; pour over beans. Microwave CHEEZ WHIZ as directed on label; pour over chips and chili. At 12 servings, these nachos are great to make and share with friends. Omit chili. Mix beans with 1/2 cup TACO BELL® Thick & Chunky Salsa before spreading on platter. Top with shredded lettuce and chopped red peppers just before using.